Some famous buildings in New York are best known for their unusual decoration and some for their unusual shapes. This is known for both, although it is not as famous as it should be. A thin, asymmetrical wedge, it is neither typical, nor derivative. The architect, Herman Lee Meader has framed the lower two stories in limestone friezes of Wild West motifs and capped the building with a very pronounced cornice that is arched in the center of the Riverside Drive frontage. The cornice, however, is just below the roofline, which has curved, arched elements at the corners and is angled to rise above the arch of the cornice. The third-story window above the entrance is also trimmed in limestone to reinforce the composition's dynamics. 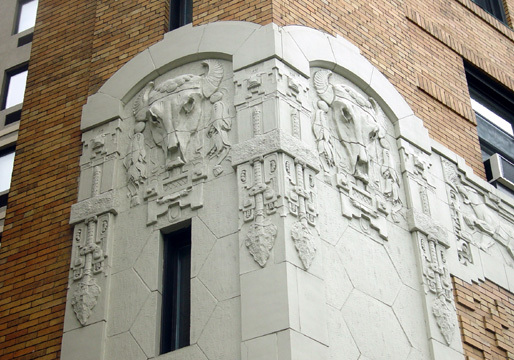 The friezes are distinguished by their fine detailing and are most notable for their buffalo skulls, and the facade also depicts mountain lions and rattlesnakes. In their superb book, "The A.I.A. 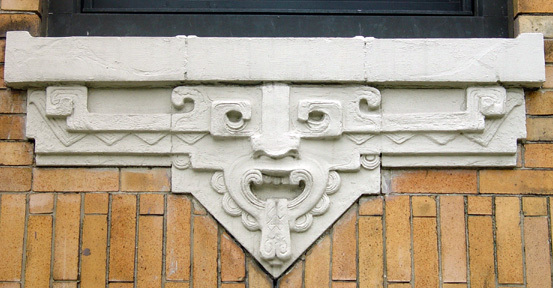 Guide to New York City, Third Edition," (Harcourt Brace Jovanovich, 1988), Elliot Willensky and Norval White said that it is "An odd building predating the Art Deco interest in Mayan motifs." They said that the friezes "symbolize the life of the Arizona cliff dwellers and serve to tie these prehistoric people to Manhattan's modern cliff dwellers." "All in all," they concluded, "an underrated facade." The building was erected in 1916 and converted to a cooperative in 1979. The 12-story structure, known as the Cliff Dwellers' Apartments, has 43 apartments. The yellow-brick building is on the north side of a bridge over 96th Street and its facade along the cross-street is marred by some fire escapes. It is across the cross-street from a large playground, which contributes to the building's considerable "light and air." The building, which is quite narrow nine feet - at its north end, permits protruding air-conditioners and has consistent fenestration. It is convenient to cross-town bus service and a local subway station at 96th Street and Broadway. It has no garage, no roof deck, no sidewalk landscaping and no balconies. It is convenient to public transportation and Riverside Park. It has fine views of the Hudson River and Riverside Park. In a January 6, 2002, article in The New York Times, Christopher Gray wrote that that the 12-story building was built by Leslie R. Palmer, a banker who also built "the highly colored loft building on the southeast corner of 14th Street and Seventh Avenue." Gray wrote that the building was erected as an apartment hotel, with five one- and two-bedroom suites on each floor served by a restaurant on the mezzanine." The lobby, he continued, "was furnished with Navajo rugs, tiles of ran, green, black and blood red; and zig-zag designs on the lamps and elevator cages reminiscent of American Indian designs." Gray added that the architect, who had worked by Ernest Flagg, had "designed a simpler but similar building for a different client at the southeast corner of 25th Street and Lexington Avenue. 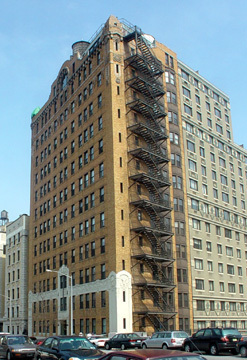 "In 1932, the building was converted to housekeeping apartments, and kitchens were awkwardly installed in the old foyers and even living rooms.Because of its small size and cramped kitchens, the Cliff Building has an unusual provision: adjoining apartments have right of first refusal on sales, and there have been numerous combinations in the building," Gray continued, adding that the building's metal and glass marquee has been removed. 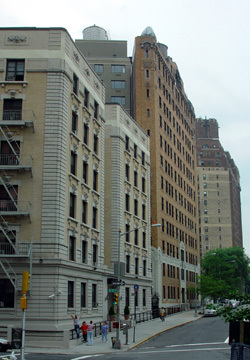 In 2002, construction began on the site just to the east of the building on 96th Street of an apartment building known as the Park West.